Private, secure mail delivery for individuals... in one central location. 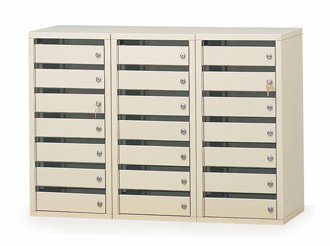 Deliver the mail through extra-large 7/8" mail slot or the security station has a large rear door that exposes all the individual pockets. Mail recipients unlock his or her private compartment to retrieve the mail. Units can be bolted together for a strong bank of steel security boxes. Perfect for doctors, students, or patient mail.